Virtual Receptionist – Give Your Business a BIG Voice!! Are you missing your important business calls? Your leads are getting slipped by your hand? Don’t panic! Your virtual receptionist will help you in guiding your clients or get connected with you when you are busy in some other important work. Hiring a Virtual Receptionist or using an IVR technology will help you in saving your money, your resources and your time and I hope those are the real things needed to make a successful Business man. Here are 5 reasons why we should go for a Virtual Receptionist. 1. Why to lose Business Leads – After all every client is important!! The competitive attitude of Business is increasing day by day. What if your client which could be proved as the most important or beneficial client for your business is missed just because he found that your number is powered off or may be you are not reachable when he tried to contact you. Yes, these things appear as silly for your Business as they are sounding. From Virtual receptionist service you will get the list of all the clients who tried to call you and even whose call is missed. If you’re a starter in the Business lane then let me inform you that you are going to face a lot of competition with MNC’s and if you have notice then you must have seen that Big Companies are unable to provide attention to individual customers but use large marketing strategies and Brand image to grab their customers. Virtual receptionist will help you in impressing your customer by creating a Brand image of your company and that too with avoiding the expense of a real receptionist. You can project a profession image of your company by providing the appearance of different department of your company. If you are a Business person and running your Business to grow it then it’s obvious that you have to handle a lot of clients at the same time. In this scenario, it usually happens that we don’t remember that with which client we have discussed what and when. Now it’ll no more appear like you have to run for the Notepad and write all the details of your clients. It’s just like get the call logs, check call recordings with notifications and all done. No doubt, if you are starting your Business some or the other day you will try to grow it as more as you can. Growing business can refer anything, may be expanding your office or transferring your branches to other parts of the country as well. But will it be beneficial to maintain different contact numbers for your different branches or hiring as number of receptionist as number of branches you do have. Obviously not you would not like that you have changed your number and your customers keep trying to contact you on that old number. NO changes, no hardware, no software. As easy as email -The most professional and personal medium. In a business saving even small amount of money is not only saving it’s an investment. Virtual Receptionist is the receptionist of your company which don’t demand salary every month, will be available to welcome your customers 24 X 7 and most important, never takes leaves. There no holiday planning of it. Virtual receptionist will help you in growing your business avoiding the investment done over the receptionist of your company. To grow any business it is important to dedicate to handle each and every call that rings into office. Virtual receptionists are always ready to assist callers 24X7 with no holiday. Nice reasons are mentioned in this blog. Thanks. Thank you so much for stopping by and commenting on this post. Yes you are right, to grow any business each and every call is important. 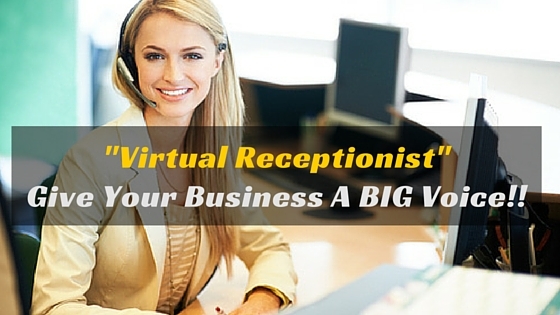 A virtual receptionist can act as your best receptionist to welcome your customers. I am very glad that you found the points defined here useful.